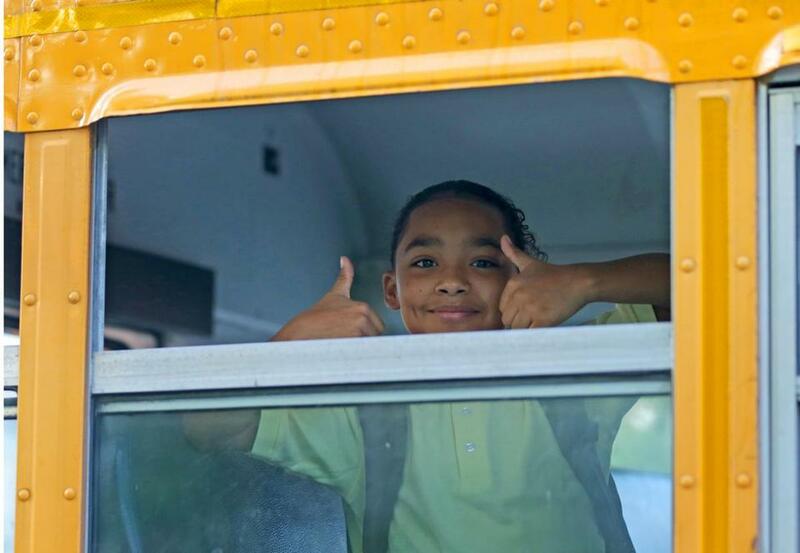 A student gives a thumbs-up on the bus on Sept. 6, 2018. Educators begin this year with the highest hopes for our students’ academic achievements and holistic progress. Our responsibility to students does not begin when they enter our schools in the morning, nor does it end when they exit our doors at the end of each day. As teachers, we recognize the individuality of each student. There is no “standard” or “average” Boston Public Schools student. As an urban district, we welcome children who come to us with a vast array of strengths and challenges. This includes different learning styles, skills, and abilities. For some children, it also includes a history of trauma. Many of our students may also experience economic challenges, housing instability, and food insecurity. We must make sure every one of our students comes to school ready to learn, so these challenges do not hamper their success or curb their potential and intrinsic gifts. As such, we are resolute in our belief that we must level the playing field and reduce the inequities that we all know persist among our schools. To do this effectively, we are asking city and state leaders, as well as the public at large, to support us in this mission as we begin another school year. We have identified three critical areas where we know we can make measurable improvement in our students’ academic outcomes. All three will require a spirit of innovation and creativity, and they will require new approaches with adequate resources to get the job done. Unlike decades past, the majority of students across a wide range of medical, learning, and emotional disabilities now learn in general education classrooms along with their peers. Including these students is the right thing to do. It builds new bonds and understanding among students with and without disabilities. It knits together the school community. If done right, it gives every student the same opportunity to succeed. Unfortunately, at the majority of schools, inadequate special education dollars and the teachers they are supposed to fund are not following students with IEPs into the classroom. Instead, a single teacher, often with multiple certifications, is being asked to teach a wide variety of students, with no help. This hinders the education of both those with IEPs and those without. We know how to fix it. The Henderson School in Dorchester is a great example. This BPS school has two certified teachers in each classroom, and some are also supported by a paraprofessional. This allows, for instance, one teacher to give a lesson on fractions, while another teacher is able to focus on the specific learning accommodations for English Language Learners and/or legally mandated small group instruction for high needs special education students. We need this model in place in every school, so that all of our students receive the same high level of individualized instruction that is offered at the nationally recognized Henderson School. Many of our students come to us with significant histories of trauma. Some have experienced or witnessed violence, some have watched their parents’ battle with addiction, some are in the foster care system, some have parents who are incarcerated, and some live in fear of deportation. We wish we lived in a society where students did not have to experience the symptoms of economic, racial, and social injustices. But that is not our reality. Students’ social and emotional wellness challenges are complex, but there are some simple things we can do to make substantial changes in their lives. First, we need a full-time nurse for every school. We are one of the only school systems in Massachusetts that does not meet this benchmark, and it has serious consequences. It is not hard to imagine two emergencies — for instance, an asthma attack during gym class at one building, and a student who is contemplating harming him or herself in another. While many may still see nurses as Band-Aid dispensaries, they are in fact leaders on the front lines of protecting our students’ welfare. Nurses’ responsibilities include responding to drug overdoses, counseling students on STI and pregnancy prevention, reporting abuse and neglect, preventing and responding to serious medical events, and managing all types of emergencies. Nurses can’t do it alone. Our district is way over the national average for number of students per school counselors. We have one counselor for every 1,338 students, while the national average is one per 482. That’s why we also need adequate resources for psychologists, social workers, and other staff who support students’ social and emotional needs. Together, these teams can identify student issues, work with families, and connect them to appropriate community resources when necessary. Approximately 3,500 of Boston’s public school students are homeless. They may stay at shelters; they may bounce around between family and friends. They may temporarily be housed outside Boston and have challenges just getting to school. We simply cannot let 5 percent of our students slip through the cracks. The problem seems enormous and complicated. Solving it will require new solutions and a resurgence of commitment by all stakeholders, including elected officials. But on this issue, too, we have experience with a model that works. Across the nation, the Community Schools movement has proven through research, time after time, to have a positive impact on our most vulnerable students. These schools provide wraparound services and integrate needed partners into the school day. The Community Schools model, called “Hub Schools” in Boston, are particularly well suited to homeless students, whose family, housing, and food security issues may fluctuate from month to month, or even week to week. This school model can connect students to transportation, medical care, and food and clothing resources. Long-term, these schools can work with community organizations and government agencies to secure permanent housing. We must make sure that students’ opportunity is not dependent on their address — or lack of one. When students are experiencing housing insecurity, school should be a place of security and stability. More Hub Schools is a step in the right direction. As educators committed to our students, we welcome opportunities for teacher-leadership in this work at the school level and beyond, and we will continue to lead. However, we know we are stronger together. During the 2018-2019 school year, we need all Boston stakeholders, elected leaders and taxpayers alike, to come together in support of our students, committing the resources they need. When we tell students to “Have a great year!” this month, let’s demonstrate the political and economic commitment that shows that we really, really mean it. Jessica Tang is president of the Boston Teachers Union.